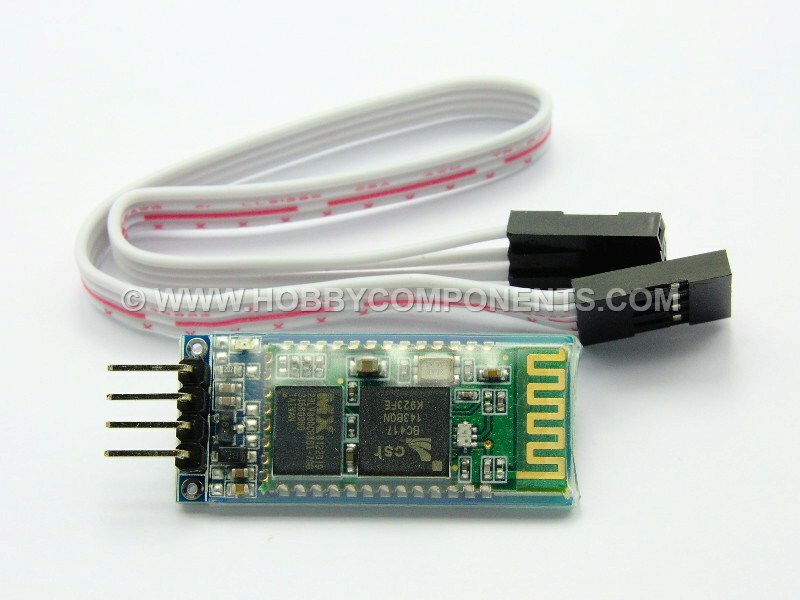 HC-06 Arduino Bluetooth Wireless Serial Port Module. These modules are available in master (HCARDU0064) and slave (HCARDU0004) versions. Please see FAQ section before purchasing one of these modules. The slave module can be purchased here. The master module can be purchased here. Module must be disconnected (Led flashing) to issue AT commands. What version of firmware do these modules have? Can a slave device be a master? No, they are fixed to either a master or a slave, you need to purchase the appropriate one. What is the purpose of the red LED? The LED indicates the current link status of the module. What is the difference between a master and slave module? The slave module is intended for communicating with other Bluetooth devices such as a laptop or smart phone. The master device is intended ONLY for communicating with a slave module. By default it will automatically pair with a slave module with no software interaction. I have purchased a master module but why can't I get it to pair with my computer? I have paired my computer to a slave so why is the modules LED still blinking? Although your computer may have successfully paired with the slave module, it may not sustain a link unless you open a serial terminal connection on your computer. When I send an AT command the module doesn’t respond and the command just appears at the remote end, why is this? Is there any way for my program to know when I am connected? Other that writing a 'ping' response into your program, the easiest way is to just issue the at command 'AT'. If you receive an OK back from the module then you are not currently connected to another device. Can a master connect to more that one slave? No, you can only connect to one slave module at any one time. I have several slave modules, can I switch the master from one module to another? Yes but in a roundabout way... Both master and slave modules accept an AT command (AT+PIN) to allow their pin code to be changed. By giving each slave module a unique pin code the master module will only connect to a slave that has a matching pin code. You can change the pin code on the master module to match the one on the slave that you wish to connect to. The only issue with this is that you cannot issue AT commands to the master whilst it is currently connected to a slave. Therefore you will either need to move the master out of range of the connected slave or cycle the masters power supply and then immediately issue a pin number change. By powering the master module via a transistor this could be done in software using a DIO pin. standard AT commands via its serial interface. Compile the sketch and upload to your Arduino. (you do not need to do anything on the module side to do this). Open up the serial port monitor in the Arduino IDE (CTRL+SHIF+M). You will now be able to communicate with the paired Bluetooth device. PLEASE NOTE that this manual covers several versions of module and is not just for the ones advertised in this thread. It includes some information and AT commands that are not relevant. For a list of AT commands see above list in this post. Please note the defect in the example code. Well spotted, the code has now been updated. Thanks for bringing this to our attention, the file should now work. admin wrote: Thanks for bringing this to our attention, the file should now work. thanks a lot. now it works! What module should I have to connect to issue the AT command ?